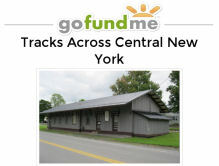 Central New York Model Railroad Club and Historical Society, Inc.: Holidays, Weather, and Trains! We had a bit of a break due to the holidays and some crazy weather. Weekly meetings have resumed and work on the new layout is moving along at a quick pace. It's time to give this blog a major makeover. Stay tuned for changes and new updates through February and March.